I initially joined the mudslinging, until I realized that there are too many players in it already. Ain’t that fun anymore. Then I realized that I actually am interested in something else. Instead of engaging in mindless arguments, I figured that I actually want to understand the status quo from a bird’s eye view. I am no political scientist so that bird won’t fly very high, but I’ll make it soar as high as my pedestrian brain can manage. Why bother? Because I want to understand if this parade will last until 2022, or if it's the Liberal Party's last hurrah. Note, however, that is not an analysis that uses morality as metric: we already have too many self-proclaimed moralists (*cough* Rappler *cough*) to do that. Instead, I will be providing an article written with competing political interests in mind. Historically, Philippine presidents are given 100 days from the start of their term before the opposition or the mainstream media hits really hard. Interestingly, however, Duterte has not even reached his 100th day in office but the atmosphere feels like the heavens are about to spew brimstone and fire. If this were a sexual encounter, it’s as if everyone skipped foreplay and went right down to you-know-what. I can’t really blame the opposition for suddenly shifting from neutral to fifth gear, especially since Duterte himself instituted radical reforms as soon as he stepped into Malacañan. In fewer than 100 days, Duterte has started turning the national political power structure upside down. Needless to say, many long-entrenched political players are not pleased. Particularly, the Liberal Party (LP) has suffered, is suffering, and will suffer the greatest casualties in Duterte’s crusade against, well, pretty much everything. A few days the May 2016 landslide win, Duterte said, “Maybe when I sit as President, I am not going to prosecute. I am not up to it actually, going after political enemies [GMA].” Many Filipinos, including me, interpreted this as a declaration that he will not torment his predecessor as much as his predecessor tormented Gloria Macapagal-Arroyo [TP: PGMA freed]. Of course, LP didn’t take Duterte’s word for it. LP hoped to impeach him at the soonest possible time and have controversial VP winner [TP: Smartmatic] Leni Robredo, one of LP’s own, installed in the Palace [TP: Leni]. Duterte extinguished this plan with the masterstroke that is Mark Villar’s appointment [TP: Plan B]. Well, I forgot that Duterte is a lawyer. Yes, there are no indications that Duterte will prosecute Aquino in the sense that no anti-Aquino court cases are in the works. But Duterte can hurt Aquino and the Liberal Party in so many other more creative and novel ways. 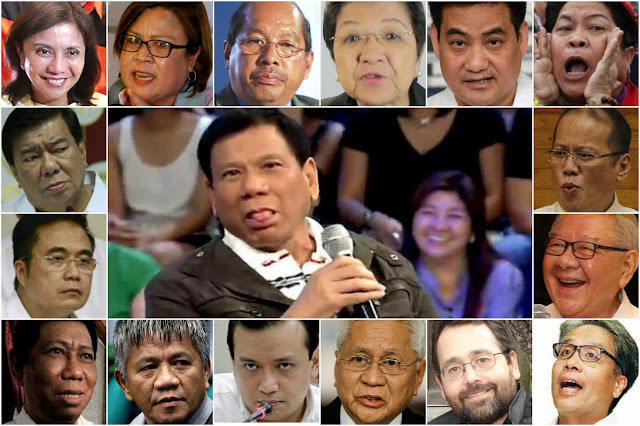 Let’s list some of them, starting with Duterte’s pre-inauguration offensive in the Lower House. Some not-so-loyal LP members, realizing that impeachment has become impossible, started to jump ship. LP started feeling real pain as Duterte’s PDP-Laban took advantage of the historically weak Philippine political party system. PDP-Laban rapidly whittled away LP’s members, transforming what was formerly a congressional behemoth into a miniscule opposition bloc [Star]. Today, LP in the lower house is as toothless as a newborn baby. Yes, this hurt LP real bad. Duterte hurting LP is like him serving LP a multi-course meal with appetizers, an entrée, a main course, and a dessert. Duterte then gave Gina Lopez the DENR portfolio [MS], to the horror of the LP-leaning mining clique. Gina Lopez, a staunch anti-mining advocate, shut down four mines in her first week in office [Star]. This is bad news for many LP members who are deeply involved in the mining industry, such as its losing presidential bet Manuel “Mar” Roxas, who owns mining stocks in at least seven mining firms [TP: Roxas and Corruption]. About a week later, Lopez padlocked Palawan’s Berong Nickel [Bloomberg]. Nickel. Yes, nickel is another cause for alarm for LP as one of its major campaign donors, the illegal miner SR Metals, is a nickel miner [TP: Roxas’ Friend]. And yes, Lopez’s anti-mining eyes are on SR Metals too [TV5], and Duterte will not stop her if she decides to tear up SR Metals’ license on National TV [TP: Miner Crony]. The mining clique is fuming, with Roxas ally Prospero Pichay [ABS] even going as far as calling Lopez “crazy” for her anti-mining stance [TV5]. Duterte then gave Rafael Mariano the DAR portfolio [PIA], to the horror of LP’s Cojuangco’s who own the bloodstained Hacienda Luisita [TP: Luisita]. Mariano, head of a militant farmer’s group who was part of the Lower House, is known for authoring HB 155 which sought to repeal the Hacienda’s stock distribution option (SDO) [Star]. The SDO was what allowed the Cojuangcos to evade land reform laws. A week into his post, Mariano swiftly ordered Hacienda Luisita Inc. to stop harassing its farmers [MS]. A month later, he vowed to “destroy Haciendas” [MS]. True to his word, he ordered the much-delayed redistribution of 358 hectares of Hacienda Luisita Land [MB]. This is still a miniscule section of Hacienda Luisita that covers thousands of hectares [Stuart-Santiago 2012]. Note, however, that Mariano still has six more years in DAR so he can still do a lot more damage. After Duterte took his oath of office, he appointed Eddie Monreal [TV5] to replace the much-reviled Airport Chief and Aquino relative Jose Honrado [MT]. Honrado was widely blamed for the Laglag-Bala airport scam [CNN]. True to his word, Faeldon installed CCTVs on every nook and cranny of BoC. He even set up a live stream of the CCTV cameras in his own BOC office for the public to see [GMA]. So far, at least one BoC employee has been arrested after being caught on CCTV accepting bribes [GMA]. These are just a few of Duterte’s hard-hitters. But to top it all off, Duterte recently issued Memorandum Circular No. 4 s. 2016, which demands the courtesy resignations of all Aquino appointees. He prefaced the memo with “In view of the President’s desire to rid the bureaucracy of corruption,” so you know what he means [Gov]. The preceding sections are just some of the appetizers, the radical reforms happening under the Duterte Administration. There are many others that I cannot mention anymore because I am writing an article, and not a booklet. Regardless, the previous sections demonstrate that Duterte’s crusade against corruption is hitting LP, and it is hitting real hard. The Liberal Party is hurting. With a Duterte-led Malacañan, LP can look forward to grimmer days ahead. Reducing LP membership, angering LP financiers, infuriating LP’s Cojuangcos, enraging LP’s appointees… these are just appetizers. Enough of the appetizers: it’s time for the entrée and the main course! For the entrée, Duterte offers the international policy realignment. For the main course, Duterte offers the War on Drugs. One of former President Aquino’s would-have-been legacies is his much-publicized crusade against what he believes is Chinese bullying in the South China Sea [Inq]. Using China’s harassment of poor Filipino fishermen, Aquino initiated arbitral proceedings against China, massively straining China-Philippines ties [TP: Davila]. Little did we know that he was against China primarily because his staunch ally, First Pacific Director and Foreign Secretary Albert del Rosario, wanted to drill for South China Sea hydrocarbons [TP: MVP]. Del Rosario business partner Manny V. Pangilinan controls most of mainstream media [TP: Reed Bank], so I am not really surprised at how such an enormous conflict of interest issue has never been covered by mainstream media [TP: Worse than Karen]. Duterte, however, never bothered to control mass media. Instead, he hit LP where it hurts the most. The recent favorable decision from the Permanent Court of Arbitration would have been the Aquino administration’s crowning glory, it would have been their legacy. However, Duterte chose not to go hardline with it [TP:Yasay], choosing a more practical and independent diplomatic strategy [TP:ASEAN], to China’s delight and to America’s chagrin. Yes, the Philippines decided to take a different trajectory in international affairs. What was once an American lapdog during the Aquino Era is now a country that has finally started asserting its sovereignty. Unfortunately for LP, Duterte’s neutral stance on the China-US geopolitical tug-o-war means Philex Petroleum will never get to drill Northwest of Palawan. MVP’s struggling Philex Petroleum appears to have realized this even before Duterte sat in Malacañan, after the company announced its plans to venture in renewable energy [Star]. Years’ worth of Aquino’s (un)diplomatic efforts translated to nothing. And now, it’s time for the main course. Not even 40 days into office, Duterte did the unprecedented: he named public officials with suspected drug links PUBLICLY. He started with five PNP Generals [TP: Robredo], then followed it up with over a hundred mayors, judges, et Al [TP: List]. The generals he named are connected with the Liberal Party. Meanwhile, many of the names he mentioned from the list are big ticket LP members, such as Ilo-ilos Jed Mabilog, a cousin of LP stalwart Senator Franklin Drilon [Politiko]. Suspicions of LP’s complicity in the illegal drug trade first arose in May 2010 when its treasurer, Quezon Governor Rafael Nantes was suspected of drug links [Balita]. Luckily for LP, he conveniently died in a chopper crash a couple of weeks later [Star]. Aquino never raised the drug issue in any of his six State of the Nation Addresses [TP: Narcopolitics], and for good reason. Illegal drugs flourished in the Philippines under the Aquino Administration [TP: China to the Streets]. Bilibid, the country’s maximum-security prison, became the shabu (meth) capital of the country [TP: 400 deaths]. Oh! And did I mention the “itchy” LP Senator Leila de Lima [TP: Oooh, Ronnie!]? Yes, Philippine Narcopolitics is real, and reports suggest that LP is largely behind it. The war on drugs will be LP’s biggest headache. In a meal that Chef Duterte prepared, this is the main course. LP is doing the best it can to survive by trying to pin on Duterte the vigilante killings of the past couple of months. LP Senator Leila de Lima, who tag-teamed with former LP Secretary-General and now Human Rights chair Chito Gascon [TP: CHR], initiated a Senate Investigation that purportedly intends to aid legislation. The first couple of hearings turned out to be a dud [TP: Destroy Duterte], reinforcing my suspicion that this is more of an anti-Duterte publicity stunt. However, there still was a small part of me that wanted to believe that these two LP peeps may just be suckers for unconditional human rights. But my doubts vanished after de Lima introduced Edgar Matobato. Matobato’s testimony was shockingly riveting. As part of the “Davao Death Squad”, Matobato suggested that Duterte terrorizes his political rivals after he testified that he kidnapped and murdered four of Duterte rival Prospero Nograles’s bodyguards [GMA]. This is just one of the many horrid things that Matobato described. But there’s something that doesn’t add up. The Nograles camp denied the occurrences of such kidnappings [GMA], let alone the murders. Moreover, Matobato’s testimony is inconsistent with a previous interview. He told the Senate he kidnapped four Nograles bodyguards, but he said he kidnapped five in an earlier interview with The Telegraph UK [Video]. Moreover, it appears that Matobato is not even a Davao City native as he claims [SunStar]. Yes, Matobato is a liar. What’s worse, Matobato was under the Department of Justice (DoJ) Witness Protection Program (WPP) in 2014 [CNN], where de Lima was still its Secretary, only to leave in January 2016 [Straits]. Matobato said he left WPP in fear of the Duterte Presidency, but Aquino was still president in January and Duterte was trailing the electoral surveys at the time [CNN]. And it appears that de Lima is lying too. Yup, a classic LP strategy. Hold on one sec! Matobato has been under WPP, under DoJ Sec. de Lima’s custody, since 2014. He stayed in there for almost two years, consuming precious public resources. Two years in WPP yet he did not even execute a sworn testimony? When the fact of the matter is that he got into the WPP because of his revelations on Duterte to begin with? Yup. This senate investigation is not really a quest for the truth, but one of the last kicks of the dying political horse that is that Liberal Party. Rody Duterte asks help from the Armed Forces of the Philippines in dealing with the drug problem, suggesting that the Philippine National Police may be unable to deal with it on its own. Duterte: The police is there but if the situation gets out of hand, it becomes yours. Do not allow the country to disintegrate. Standing behind him were General Ricardo R. Visaya AFP and Labor Sec. Silvestre Bello III.